Benzene is an organic chemical compound with the molecular formula C₆H₆. Its molecule is composed of 6 carbon atoms joined in a ring, with 1 hydrogen atom attached to each carbon atom. Benzene was prepared from coal tar by August W. von Hofmann in 1845. Coal tar remained the primary source for the industrial production of benzene for many years, until petroleum-based technologies became competitive about 1950. Current production is about 6 million tons per year in the United States. A substantial portion of this benzene is converted to styrene for use in the preparation of polystyrene plastics and films. The classification of hydrocarbons as aliphatic or aromatic took place in the 1860s when it was already apparent that there was something special about benzene, toluene, and their derivatives. Their molecular formulas (benzene is C6H6, toluene is C7H8) indicate that, like alkenes and alkynes, they are unsaturated and should undergo addition reactions. Hydrogenation of benzene and other arenes is more difficult than hydrogenation of alkenes and alkynes. Two of the more active catalysts are rhodium and platinum, and it is possible to hydrogenate arenes in the presence of these catalysts at room temperature and modest pressure. Benzene consumes three molar equivalents of hydrogen to give cyclohexane. All compounds that contain a benzene ring are aromatic, and substituted derivatives of benzene make up the largest class of aromatic compounds. Many such compounds are named by attaching the name of the substituent as a prefix to benzene. Many simple monosubstituted derivatives of benzene have common names of long standing that have been retained in the IUPAC system. Dimethyl derivatives of benzene are called xylenes. There are three xylene isomers, the ortho (o)-, meta (m)-, and para ( p)- substituted derivatives. A wide variety of important organic compounds are derived from benzene, by replacing one of the hydrogens with different functional group. They can both common and systematic names, which can be confusing; here we’ve a infographic of benzene derivatives from Compound Interest, in which common names of benzene derivatives are shown primarily, with systematic names shown in Italics. 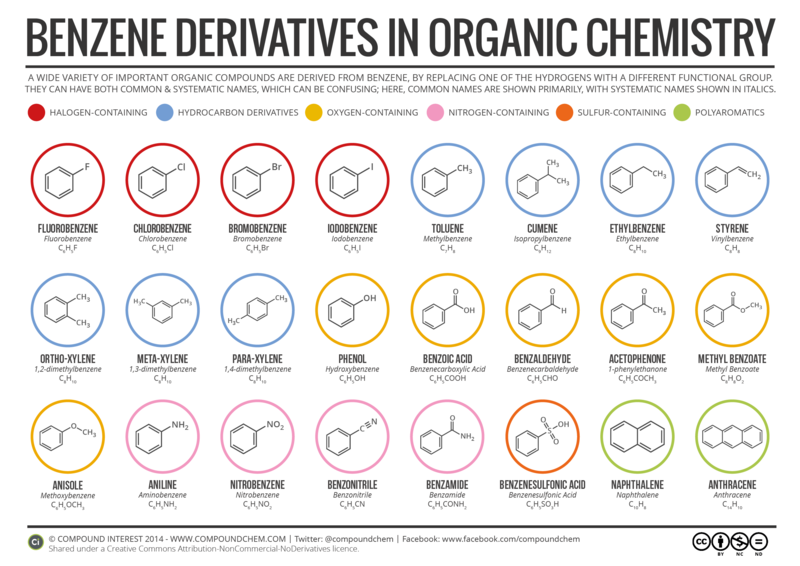 Following Benzene Derivatives are shown in this infographic with their common names, systematic names, structure formulae and molecular formulae.